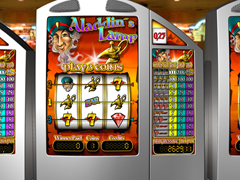 Aladdin’s Lamp Pokie Review - Play today! This pokie offers you your own Aladdin’s lamp and will allow you to spin it and rub it as many times as you feel it necessary to make all your winning wishes come true. Boss Media ensured this pokie to be totally different starting from the look. Players will experience the magic on 3 reels with 3 paylines and a large variety of winning combinations. This interesting pokie offers a progressive jackpot with a second highest payout of 2.000 coins. A large coin denomination offers everyone the opportunity to enjoy the Aladdin’s lamp with betting starting from a minimum of 0.25 to the maximum bet of 5.00. This pokie display the reels and the payout columns on the same page but with a very definite steel panel separating them. The three white reels are displayed on a drum with 3 wheels individually turning and the paylines are indicated across the 3 screens in different colours. Winning information and credits are displayed in electronically created digits. The symbols are Aladdin, Aladdin’s lamp, yellow seven on a red square, single bar in shades of purple and turquoise and red diamond shaped rubies. The pokie offers no bonus games, however, you will be able to win a massive jackpot displayed below the pay table. To win this amount you will need to get 3 symbols with the genie, the game will also require you to play maximum bet, which is 3 coins at a coin value of your choice. The genie symbol can land on any of the paylines to reward you with this bonus prize. The display and the reels on the same screen conveniently offers players the benefit of making informed decision when they place bets. The columns showing in three reels the different payouts form different bets informs player of the influence their bets have on the payouts once they hit a great winning combination.